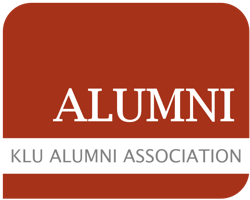 Articles of KLU Alumni Association e.V. (1) The association is administered under the name "KLU Alumni Association". (2) It shall be entered in the register of associations. Following entry, the suffix e.V. (registered association) will be added to the name. The association has its seat in Hamburg. (3) The financial year begins on 1 October and ends on 30 September of the year. (1) The purpose of the association is to promote science and research as well as education, popular education and vocational training, including student assistance. (2) The purpose of promoting science and research is achieved by collecting funds and allocating funds for research and teaching at colleges and universities, in particular by allocating funds to the Kühne Logistics University. The purpose shall also be achieved by promoting scientific exchanges between businesses and universities and by promoting international exchanges between higher education institutions and universities. (3) The purpose of promoting popular and vocational education, including student assistance, is achieved by organizing and funding lecture and discussion events for students, especially students at Kühne Logistics University. The purpose is also achieved by promoting exchanges between former and active students at Kühne Logistics University with the aim of providing students with guidance for their future career choices. In addition, support will be given to measures and institutions aimed at continuing education and preparing the student body for the profession. (1) The association pursues exclusively and directly charitable purposes in the sense of the section "tax- privileged purposes" of the tax code. (2) The association is selflessly active; it does not primarily pursue its own economic purposes. (3) The association's funds may only be used for purposes in accordance with the statutes. The members do not receive any contributions from the funds of the association. (4) No person may be favoured by expenses which are alien to the purpose of the association or by disproportionately high remunerations. (5) If the association is dissolved or tax-privileged purposes cease to apply, the assets of the association shall be transferred to Kühne Logistics University GmbH, which shall use them directly and exclusively for charitable purposes. The distribution of assets may only take place after approval by the tax office. (1) Alumni as well as friends and sponsors of Kühne Logistics University GmbH can become members of the association. This includes natural persons and legal entities under public and private law (corporations, institutions, foundations, associations, etc.). (2) Only alumni can become members of the association with voting rights. All other members have no voting right at the general meeting of the association. An alumnus or alumna is anyone who has successfully completed a study or continuing education program at Kühne Logistics University, or who has been professionally tied to Kühne Logistics University. (3) The application for admission must be submitted in writing to the Executive Board. (4) With the application, the applicant acknowledges the statutes in the event of his admission. There is no entitlement to admission. (5) The board decides on the admission. The decision shall be notified to the applicant and need not be substantiated. (6) Membership begins with the admission decision. (1) Members are charged annual dues, the amount and due date of which are determined by the general meeting. (2) Annual dues paid will generally not be refunded. (3) Voluntary resignation takes place by written declaration to the executive committee. (4) The Executive Committee may expel a member from the Association if he or she has violated his or her obligations as a member, in particular if he or she has contravened the purposes or principles of the Association or has not paid the membership fee despite two reminders. The membership of a natural person ends through death. (1) The executive committee of the association consists of at least three and at most five persons - the chairman, the deputy chairman and the treasurer as well as up to two assessors. One member should preferably come from the circle of Kühne Logistics University GmbH employees. (2) Only the chairman and the deputy chairman are board members within the meaning of § 26 BGB. Only these two members are authorized to represent the association alone. The other board members are not entitled to represent, but are entitled to vote at board meetings. When the term "Management Board" is used in these Articles of Association, the Management Board shall always be referred to in accordance with paragraph 1 of this § 7. (3) The executive committee is responsible for all affairs of the association, as far as they are not transferred by the statute to another organ of the association. (4) The executive committee decides in meetings, which are called by the chairman or its deputy in written or verbal form. (5) The executive committee has a quorum if at least three of its members are present. In the event of a tie, the vote of the Chairman shall be decisive; in the absence of the Chairman, the vote of the Deputy Chairman shall be decisive. (6) Minutes shall be taken of each meeting of the Board of Directors. The minutes may be taken electronically and must in any case include the place and time of the meeting, the names of the participants, the decisions taken and the results of the vote. (7) The Executive Board may also pass resolutions in writing, electronically (by e-mail) or by video conference. The above provisions shall apply accordingly. (1) The executive committee is elected by the general meeting for a period of 2 years, calculated from the date of election. The executive committee remains in office until a new election takes place. (2) Each member of the Executive Board must be elected individually. Only natural persons who are members of the association can be elected as members of the board. With the termination of the membership in the association also the office of a board member ends. (3) If a member of the Executive Board retires prematurely, the Executive Board may elect a successor for the remaining term of office of the retired member. (1) The ordinary general meeting takes place once a year. It shall be convened by the Executive Board with four weeks' notice in writing or by e-mail, stating the agenda. The period shall begin on the day following that on which the letter of invitation was sent. The letter of invitation is deemed to have been received by a member if it is sent to the last address (postal or electronic) given in writing by the member to the association. The executive committee can convene an extraordinary general meeting on important occasions - or if the interests of the association require it. If at least one third of the members request this in writing, stating the purpose and reasons, a meeting must be called within three months. (2) The agenda is set by the board of directors. Any member may, however, apply in writing to the Executive Board for an addition to the agenda up to one week before the General Meeting at the latest. The chairman of the meeting has to announce the additions at the beginning of the general meeting. The meeting shall decide on admissible motions to add items to the agenda. (3) The general meeting shall be chaired by the chairman or, in his absence, by the deputy chairman or the treasurer. If no board member is present, the meeting shall appoint the chairman of the meeting. The chairman of the meeting appoints the minute-taker. (4) Minutes shall be kept of the resolutions of the General Meeting and shall be signed by the chairman of the meeting and the minute-taker. (f) Resolution on the exclusion of members. (2) Each member entitled to vote (§ 4 paragraph 2) has one vote in the general meeting. Another member may be authorized in writing to exercise voting rights. The power of attorney must be granted separately for each general meeting. The type of vote shall be determined by the chairman of the meeting. Voting must be in writing if one third of the members present and entitled to vote request it. The general meeting has a quorum if it is duly convened, without prejudice to the members present. (3) The General Assembly passes resolutions with a simple majority of the valid votes cast. Abstentions and invalid votes shall not be counted when the result of the vote is established. A majority of two thirds of the valid votes cast is required for an amendment to the statutes; a majority of four fifths of the votes is required for the dissolution of the Association and for a change to the purpose of the Association. The written consent of the members not present at the general meeting can only be declared to the executive committee within one month. (4) In elections, a person is elected who has received more than half of the valid votes cast. If no one has received more than half of the valid votes cast, a second ballot shall be held between the two candidates who received the most votes. The person who has received the most votes is then elected. If the number of votes is the same, the drawing of lots to be made by the chairman of the meeting shall be decisive. (1) The executive committee can decide on the constitution of an advisory board. (2) The Advisory Board advises the Executive Board in all matters of the Association which are referred to or accepted by the Advisory Board. The Executive Board shall inform and hear the Advisory Board in all important matters. The Advisory Board may draw up guidelines for its work and recommend such guidelines for the Association's activities. (3) The Advisory Board shall consist of a maximum of five members. They do not have to be members of the association. (4) Members of the Advisory Board are appointed by the Executive Board. Their term of office ends with the term of office of the Executive Board. The members of the advisory board may be reappointed. (5) The Advisory Board shall appoint a Chairman from among its members. (6) The Advisory Board must be convened at least twice a year by the Chairman. In addition, it must be convened by the Chairman if two members of the Advisory Board so wish in writing. (7) Members of the Advisory Board who have been absent without excuse from the meetings of the Advisory Board three times in succession shall resign from the Advisory Board. (1) The dissolution of the association can only be decided in a general meeting (§ 10 Abs. 3). (2) Unless the general meeting decides otherwise, the chairman and the deputy chairman shall be jointly authorized liquidators. (3) The assets available after the liquidation are transferred to Kühne Logistics University GmbH. The assets may only be paid out after approval by the tax office (§ 2 par. 6).